Apple needs its next-generation iPhone to be a smash hit in order to reassure investors. 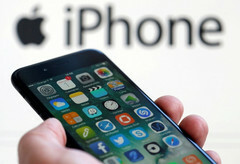 The company reported Tuesday that it sold fewer iPhones than analysts had expected in the company's second quarter. The latest news of disappointing iPhone sales in the second quarter of 2017 put Apple’s stock into a slight 2% slump on Tuesday. These few months typically see slower iPhone sales compared to the rest of the year, but Apple CEO Tim Cook attributed this year’s phenomenon to expectations for the next iPhone scheduled for next fall. In a conference call on Tuesday, Cook said that there was more anticipation than usual for the iPhone 8. “We’re seeing what we believe to be a pause in purchases of iPhones which we believe are due to the earlier and much more frequent reports about future iPhones,” Cook said. The new iPhone is probably not the only contributing factor, as Apple is also being affected by macro trends in the smartphone market. Apple is aware that growth is slowing in the high-end flagship market, so it should be no surprise their Q2 earnings forecast was about $1 billion short of Wall Street estimates. Apple has taken some actions to reassure investors, specifically their plan to help return capital to shareholders with buybacks and dividends. Apple CFO Luca Maestri said that the company will put $50 billion towards share repurchases.